Social Science in the Caucasus: Who trusts the police in Georgia? The 2004 police reform in Georgia was regarded as a successful transformation of one of the most corrupt institutions in the country into a functional entity. The reform included the mass dismissal of police officers, rebranding of units with new equipment and a new image, and increasing the salaries of police officers in order to decrease the incentive to solicit or accept bribes. Largely as a result of this reform, as Alexander Kupatadze claimed in 2012, “Georgia has been portrayed as the ‘safest place in Europe’ with low victimization and low crime rates,” and as crime rates went down, the police earned increased public trust. However, a recent study on the effectiveness of the Ministry of Interior by several Georgian NGOs including Transparency International Georgia, Georgian Young Lawyers’ Association, and Georgian Democracy Initiative among others highlights a number of violations by the patrol police during searches of people on the streets in 2013. A joint statement by leading Georgian NGOs published in August 2013 identified some of these violations. The statistics released by the Georgian Ministry of Interior show that the number of registered crimes decreased by 17% from 2013 to 2014, while the number of solved cases increased from 58% to 63% in the same period. However, doubts on the reliability of this data, as well as on the legitimacy of police raids and random searches persist. A public opinion poll conducted by ACT in 2013 shows that 34% of Georgians believe that the crime rate increased in Georgia over the last year, while 18% think it decreased. Considering this quite unstable situation, it is important to understand how levels of trust in the police have changed over time and who trusts the police. 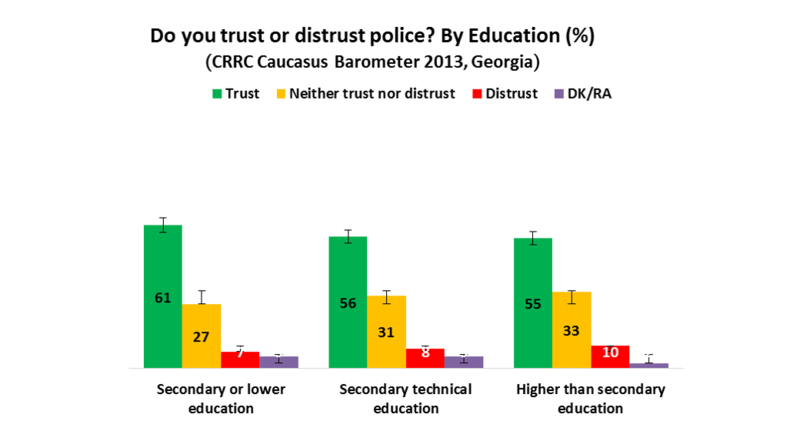 Looking at CRRC’s Caucasus Barometer survey data for the period between 2008 and 2013, this blog post examines the Georgian population’s reported trust in the police by settlement type and education. During this period, different levels of (dis)trust in police have been recorded, with distrust gradually decreasing and trust fluctuating. The highest level of trust (67%) was recorded in 2011. It decreased to 50% in 2012, but increased to 58% in 2013. The share of those reporting “neither trusting nor distrusting” the police has increased from 19% in 2008 to 30% in 2013, with fluctuations in between. Note: The original 5-point scale used for this question was re-coded during the analysis into a 3-point scale. Answer options “Fully distrust” and “Somewhat distrust” were combined into the category “Distrust,” and “Somewhat trust” and “Fully trust” into “Trust.” “Neither trust nor distrust” was not re-coded. Who trusts the police in Georgia? Interestingly, no differences are observed in trust in the police by age or gender. The 2013 Caucasus Barometer data shows that residents of rural settlements express trust in the police more frequently than those living in urban settlements and in the capital (67%, 52% and 49%, respectively). Consequently, distrust is higher in the capital and other urban settlements (11% in both cases) compared to rural ones (5%). It should be noted, however, that a similar trend can be observed in the reported trust towards any other social institution, with the rural population, overall, reporting higher levels of trust. There are very small differences in levels of trust in the police by education. Those with secondary or lower education tend to trust police slightly more compared to those with secondary technical or higher education (61%, 56% and 55%, respectively). Note: The variable measuring education level was re-coded, so that answer options “No primary education”, “Primary education (either complete or incomplete)”, “Incomplete secondary education” and “Completed secondary education” were combined into the category “Secondary or lower.” Answer options “Incomplete higher education”, “Completed higher education”, and “Post-graduate degree” were combined into the category “Higher than secondary education”. “Secondary technical education” was not re-coded. 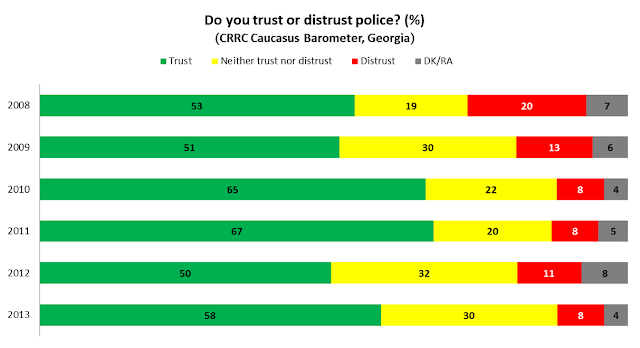 Overall, the data shows that the share of those who report “neither trusting, nor distrusting” police has increased over the years in Georgia, while the share of those who distrust the police decreased. People living in rural settlements tend to report trusting police more than people living in other settlement types. There are very small differences by level of education and no differences by age or gender. To explore issues related to trust in social and political institutions, take a look at the Caucasus Barometer data using CRRC’s Online Data Analysis tool.